Activyl is a great new spot-on flea treatment for dogs and cats. It comes in 5 size ranges for dogs from 4 lbs (1.5 kgs) to 132 lbs (60 kgs) body weight. It comes in 2 size ranges for cats from 2 lbs to over 9 lbs body weight. You can buy Activyl in a single dose, 6 pack or 12 pack. 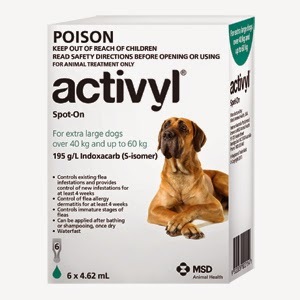 You can find more information on where to purchase here at Activyl Spot-On Flea Treatment.